Simply complete this form to learn more about Barton's telemedicine solutions. Thousands of healthcare organizations across the U.S. have relied on Barton Associates’ on-site staffing solutions to fill their departments with top-tier talent. 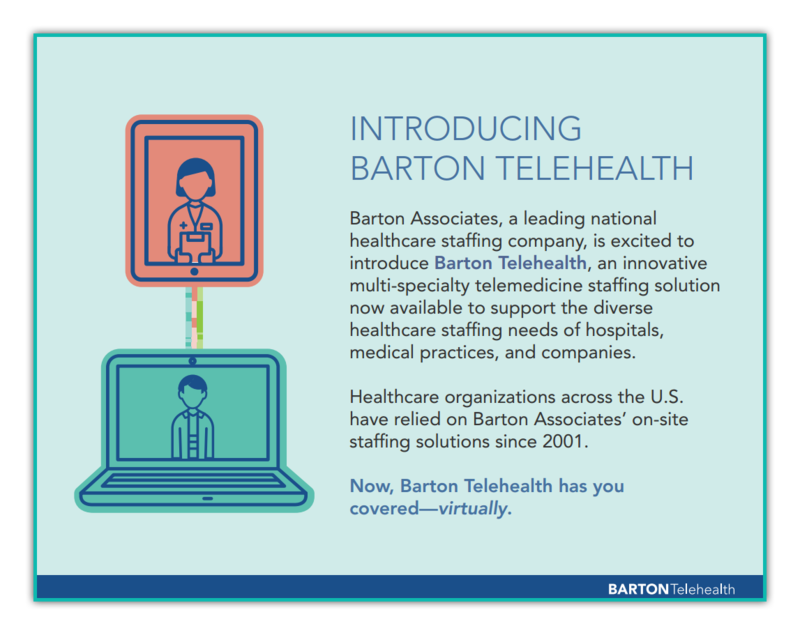 Now, with Barton Telehealth, organizations can expect the same caliber of providers and service they have come to rely on from Barton Associates. With this easy-to-use and highly effective web-based telemedicine platform, remote locum tenens staffing will never be easier or more convenient. Save money while adding efficiency. Barton Telehealth helps your operation avoid travel-related expenses typically associated with on-site staffing services. We bring the providers to you — virtually! Barton Telehealth gives your organization the tools needed to increase capacity, see more patients, and generate greater revenue. Getting started with Barton Telehealth is fast and easy, giving your team the flexibility needed to react quickly, operate at peak efficiency, and thrive. Barton Telehealth does not require expensive, specialized equipment. All your team needs is a computer with a webcam, a microphone, and a high-speed internet connection.